NTUC LearningHUB (LHUB) is tapping on the content and expertise provided by Amazon Web Services (AWS) Educate, a global programme that provides a robust set of learning resources for trainees and trainers to acquire the latest cloud computing skills. Along with NTUC’s Employment and Employability Institute (e2i), the partnership will be providing two new courses that will be offered as Workforce Skills Qualifications (WSQ) funded courses. 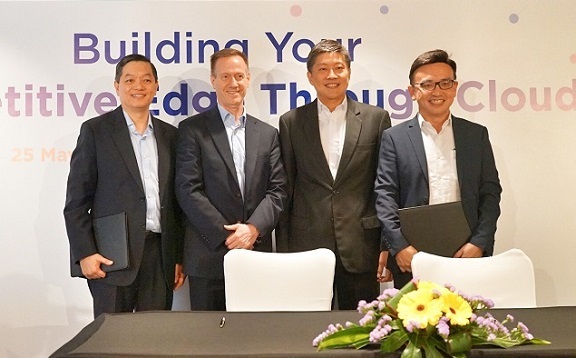 This initiative will help address the demand for cloud computing and solution development skills in the market by raising cloud computing literacy among working Singaporeans adults. -To gain basic knowledge of the Cloud Computing and Internet of Things in terminology, structure and basic concepts. -Examine cybersecurity and privacy issues and highlight how IoT can optimize processes and improve efficiencies in businesses. -Knowing how to provision exactly the right type and size of computing resources to power new ideas. The proposed take-away of both courses will be learning from the best practice framework that has been drawn from both the public and private sectors internationally. “LHUB together with e2i, will continue to develop more cloud related courses as part of the collaboration with Amazon Web Services,” Ng mentioned. In the initial phase, up to 120 training places will be offered under each course. Quah added that to encourage staff to learn about cloud computing, employers should make use of the provisions provided by SkillsFuture, to send their employees to learn about these causes. New research suggests Singaporeans are making major misjudgments when planning their retirement, meaning they could end up working..